Guests await first 'choose-your-thrill' in the United States. Rendering of Hershey Park's Triple Tower attraction. Over the past month or so, Hershey Park has been teasing the unveiling of a new mystery ride set to premiere in 2017. There were several mind-boggling clues along the way, but we were too boggled to keep up with all that and now the wait is over. Meet the Triple Tower, an exhilarating series of progressively taller free-fall drops. Hershey Park officials presented plans for the Triple Tower at a Tuesday morning news conference, confirming the start of construction activity just after Labor Day. 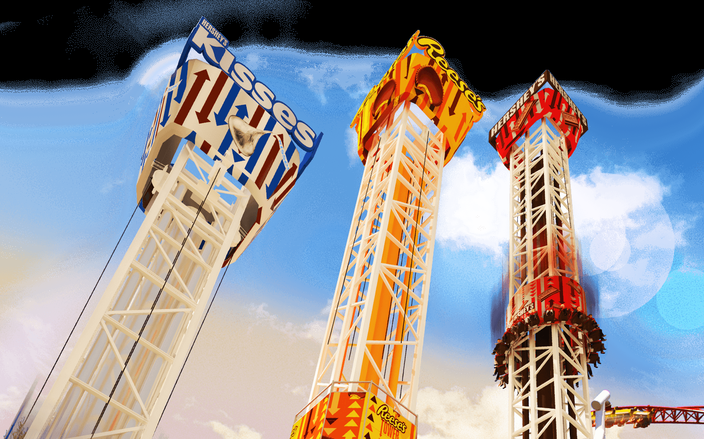 The first tower, for Hershey Kisses, will seat 12 people for an 80-foot drop. The second tower, for Reese's Cups, will seat 16 riders for a 131-foot drop. 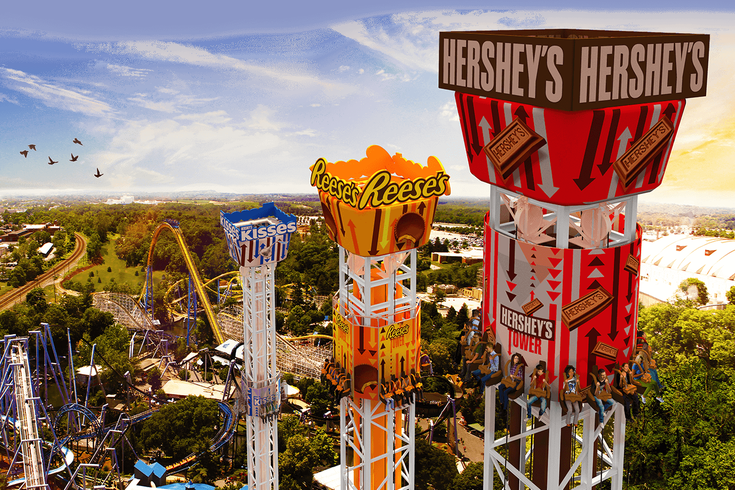 Lastly, the Hershey's Tower will seat 20 riders for a 189-foot drop. Each ride will feature an enlivening 45-mph plunge. To make way for the new rides on Kissing Tower Hill, the park will move Frog Hopper and Convoy to another section of the hill and Red Baron to an entrance across from the Boardwalk. Flying Falcon will be removed from the park altogether. Triple Tower is expected to be completed in the winter and ready to go for the 2017 season.